The Devi, as the goddess Durga is epitomized as the Shakti who wards off all evils. Durga also means hill. A very difficult task is often described as an uphill task. In the presence of Durga Shakti, negative forces fade away. Durga is referred to as“ Jaya Durga” or the one who brings in Victory (Jai). She is Durgatipariharini – one who removes obstacles. She transforms negativity into positivity. Even difficulties find it difficult to come near her. When you pray to the Mother Divine as Durga, you become courageous, victorious and compassionate. That is the beauty in the divine being attached to the mother.She nourishes all the qualities, nurturing the positive. It is like collecting good luck. For example, when you are with the mother all the ‘goodies’ are available. We become meritorious and we gain the power to manifest good luck and hold or sustain it as well. 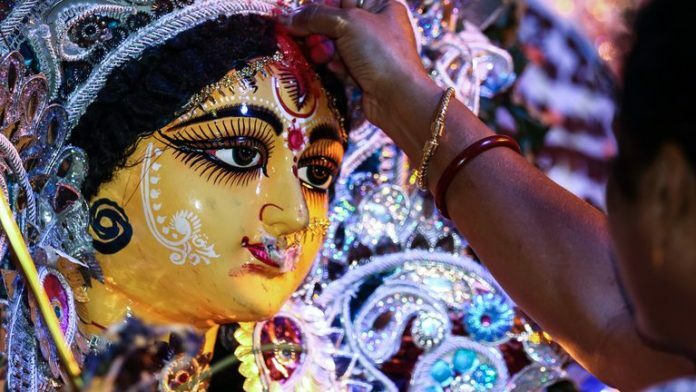 Many times life may shower you with courage, prosperity and abundance but your ability to hold and transform this energy into happiness and compassion is lacking.Navaratri is a special time to pray to Durga to have all these qualities together – uniting and harmonizing –magnifying and inculcating it in one’s life. If we are always victorious but not happy there is no use. Similarly, if we are always making efforts but never succeeding, that is also frustrating. The Durga energy can give you all together. All the qualities are available to you as one unit. We pray to Durga for all these qualities to be instilled in our consciousness bringing physical well being, material fulfillment and spiritual upliftment. 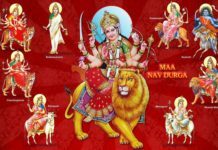 Durga is associated with red. She is depicted as wearing a red saree. Red is the colour of dynamism – a bright attitude, the ‘moving’ energy. You may be trained and skilled but if you are not able to move things together, move people ,your efforts in unison, the fruits are delayed. But when you pray to Durga, she makes this possible. The fruit is immediate. Prayer is always associated with wish fulfillment. When you are fulfilled, it is a chain reaction. If you are successful in one thing you want to try and try again for more and more. So, it is not necessary that you will attain contentment. The natureof consciousness is dynamism, wanting action. Pray for dynamism but feel the stillness. The Mother Divine is Prakriti or this entire creation. Everything is this creation is made up of the three gunas or qualities: Sattva, Rajas and Tamas. Sattva is associated with calmness, clarity of mind, enthusiasm and peace. Rajas is needed for action but often creates feverishness. Tamas is inertia and an imbalance in tamas can lead to laziness, dullness and even depression. When you handle tamas properly you move into sattva. Every being in this creation is caught in the play of the gunas. How does one come out of this cycle, and transcend these boundaries? For that, you need to raise your sattva and come out of the cycle through proper meditation, silence and food control. Transcending the gunas, one gets established in the Shiva tattva or the pure and infinite consciousness. 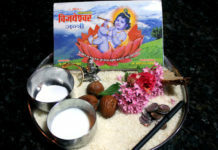 Prakriti is full of the opposites like night and day, heat and cold, pain and pleasure, joy and sorrow. Rising above the opposites, transcending duality, once again the Shiva tattva is attained. 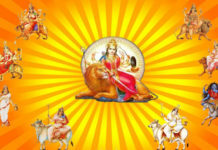 This is the purpose of all the pujas during Navaratri -to manifest the unmanifest and unseen energy, the Durga Shakti, by whose grace one can transcend the gunas and attain the supreme, undivided, indivisible, pure, infinite consciousness .This is possible when you are immersed in the Guru Tatva (principle), only in the presence of the Master. The writer is the sister of Sri Sri Ravi Shankar, meditation teacher, and Director of Women and Child Welfare programs of The Art of Living Foundation.